Myxoinflammatory fibroblastic sarcoma (MFS), synonymous with inflammatory myxohyaline tumor of distal extremities with virocyte-like cells, is a unique low-grade sarcoma that predominantly occurs in distal extremities of adults and displays characteristic histopathological features. ,, Lately, MFS has been uncommonly documented at nonacral sites. , Herein, we present two cases of MFS occurring at acral and nonacral sites, respectively. A 40-year-old lady referred to us with history of a gradually developing lesion in her hand that was excised elsewhere and diagnosed as giant cell tumor (GCT) of the tendon sheath. Another, 45-year-old lady referred with a neck swelling that was excised elsewhere. In both cases, slides and paraffin blocks were submitted to us for review. Grossly, the first lesion measured 3 × 2.5 × 2.5 cm. Cut surface was solid, gray-white. 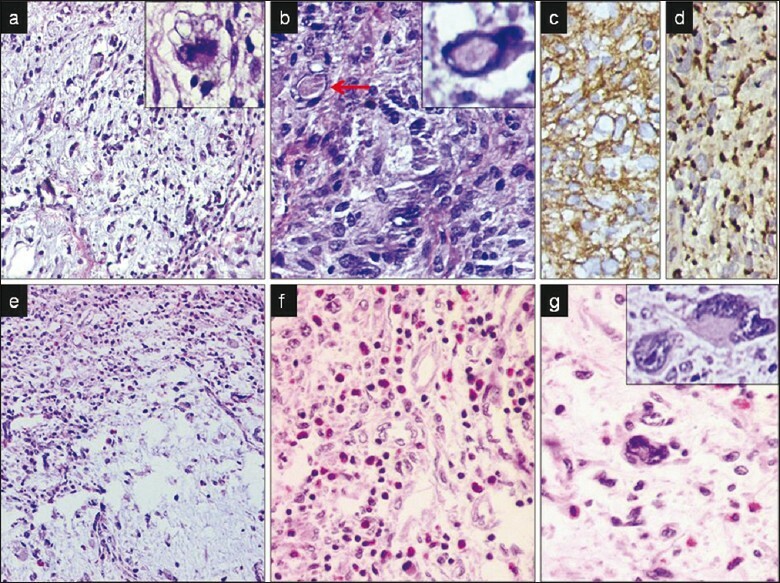 Microscopically, both cases showed an infiltrating tumor with myxoid and fibrous nodules, comprising fibroblastic and inflammatory cells, including lymphocytes, plasma cells, macrophages, and eosinophils, the latter numerous in the second tumor [Figure 1] a, e, f. Interspersed were cells with enlarged nuclei and prominent nucleoli, reminiscent of virocyte-like intranuclear inclusions or Reed-Sternberg-like cells [Figure 1] b, g). Focal hemosiderin deposition was noted. Additionally, pseudolipoblastic cells were identified in the first case ([Figure 1] a, inset). There were no mitoses or necrosis in either tumor. On immunohistochemistry (IHC), the first tumor was positive for vimentin, CD34, and CD68 ([Figure 1] c, d), while negative for desmin. MIB-1 labeling index was low (2-3%). The second tumor ([Figure 1] e to g) was positive for vimentin and negative for SMA, desmin, MyoD- 1, S100-P, CD34, CD15, CD30, and Alk1. Diagnosis of MFS was offered in both cases [Figure 1]. As the sections from margins were not submitted, comments regarding types of resections could not be made. Both cases displayed histopathological features of MFS, presence of which and lack of osteoclast-like giant cells, ruled out a GCT of the tendon sheath. Absent mitoses and tumor necrosis also ruled out an inflammatory MHF and an MFS-like pleomorphic sarcoma. Immunohistochemically, diffuse vimentin positivity in both cases, and CD34 and CD68 positivity in the former tumor, with SMA negativity, reinforced diagnosis of MFS and its fibroblastic lineage. ,, CD30 and CD15 negativity ruled out Hodgkin lymphoma, especially in the second tumor. Aforementioned features with SMA, desmin, and ALK1 negativity ruled out an inflammatory myofibroblastic tumor. Prominent inflammatory component, giant cells and lack of curvilinear vessels, despite pseudolipoblasts in the first tumor, ruled out a myxofibrosarcoma. In view of eosinophils and intranuclear pseudoinclusions, initially, MFS was linked with a viral etiology. However, no such evidence was identified on IHC and molecular techniques. , Lately, studies have disclosed a reciprocal translocation t (1; 10)(p22, q24) in an MFS and further, its morphologic and genetic "linkage" with hemosiderotic fibrolipomatous tumor (HFT). We did not identify HFT-like areas, although focal hemosiderin pigment was noted in both tumors. To conclude, diagnosis of MFS is vital, as it is under diagnosis as a benign lesion can lead to under treatment that could probably result in recurrences, whereas, an over diagnosis in form of MFH could result in radical treatments, instead of wide excision. Both the study cases were recommended follow-up, in view of unclear margins. Careful evaluation of clinicopathological features, and above all, an index of suspicion, can lead to a correct diagnosis of MFS. 1. Meis-Kindblom JM, Kindblom LG. Acral myxoinflammatory fibrosarcoma: A low-grade tumor of hand and feet. Am J Surg Pathol 1998;22:911-24. 2. Montogomery EA, Devaney KO, Gioardano TJ, Weiss SW. Inflammatory myxohyaline tumor of distal extremities with virocyte or Reed- Sternberg like cells: A distinctive lesion with features simulating inflammatory conditions, Hodgkin's disease and various sarcomas. Mod Pathol 1998;11:384-91. 3. Michal M. Inflammatory myxoid tumor of soft parts with bizarre giant cells. Pathol Res Pract 1998;194:529-33. 4. Jurciæ V, Zidar A, Montiel MD, Frkoviæ-Grazio S, Nayler SJ, Cooper K, et al . Myxoinflammatory fibroblastic sarcoma: A tumor not restricted to acral sites. Ann Diagn Pathol 2002;6:272-80. 5. Premalata CS, Rama Rao C, Padma M, Vijaykumar M. Myxoinflammatory fibroblastic sarcoma--report of a rare case at an unusual site with review of the literature. Int J Dermatol 2008;47:68-71. 6. Hallor KH, Sciot R, Staaf J, Heidenblad M, Rydholm A, Bauer HC, et al. Two genetic pathways, t (1;10) and amplification of 3p11-12, in myxoinflammatory fibroblastic sarcoma, haemosiderotic fibrolipomatous tumour, and morphologically similar lesions. J Pathol 2009;217:716-27.